What better way to get started than with a tried and true recipe of my Dad’s? Chili! Brandon usually starts asking for chili as soon as football season starts but I’m one of those people who just can’t do chili until it gets cold out – and in the South, who knows when that will be? Lucky for Brandon, it got chilly pretty early this year so I made a big pot of chili while he enjoyed Sunday NFL football. And check out the special ingredient you add in the last 10 minutes of cooking…who’d of thought? In a dutch oven or heavy pan, brown meat and onions. Drain well and wipe out pan. Add all ingredients except for cocoa powder and simmer, covered, for 1 hour. Uncover and simmer for another 15-30 minutes. Add cocoa powder 10 minutes before serving. 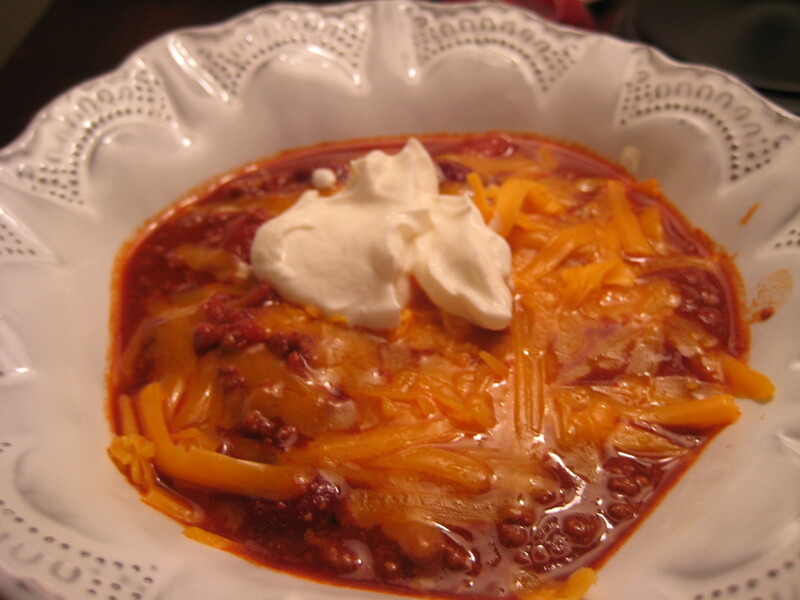 Serve with your choice of chili condiments – we like hot sauce, sour cream, cheddar cheese and crushed saltine crackers. Cornbread is great on the side – either plain or mix in some chopped jalapenos and cheddar cheese. That looks yummy! I will have to try your Dad’s recipe. I like trying out different recipes for chili. Thanks Melissa! I need to take a new photo of it – the one I have up is pretty bad! Sometimes I substitute black beans for 1 can of the kidney beans and add chopped green bell pepper to sneak in more veggies.